The What: Leyard and Planar have launched the Leyard LED MultiTouch, a seamless LED touch-enabled video wall. This solution offers a smooth, lightweight, and durable LED touch surface that leverages patent-pending Leyard Pliable LED Touch Surface (PLTS) technology. 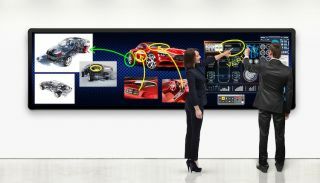 The What Else: The Leyard LED MultiTouch brings interactivity to fine-pitch LED video walls, opening up LED display technology to a wide range of collaborative applications. The LED MultiTouch offers a seamless touch experience for LED video walls up to 196 inches diagonal with high-resolution 1.2 millimeter pixel pitch. The Leyard LED MultiTouch allows for up to 32 simultaneous touch points, enabling multiple users to simultaneously interact with the video wall without affecting other users. Unlike glass panels, which can trap heat and reflect light, the Leyard LED MultiTouch features Leyard PLTS for an anti-glare surface that eliminates the distracting reflections that can occur in well-lit environments. The display delivers a crisp, high-contrast image using the high-quality black LEDs, and maintains uniform color and brightness even when viewed off-axis. The Leyard PLTS touch surface material is designed to be extremely durable, protecting the video wall from damage that can occur from casual contact or debris getting on the display, while avoiding the heat that is commonly trapped in protective glass installations. The lightweight touch surface can be removed and then reapplied, making it easy to service.